DIY: Make Your Own Jar of Ghee, aka "Liquid Gold"
Ghee, or Indian clarified unsalted butter, is delicious and easy to make at home. 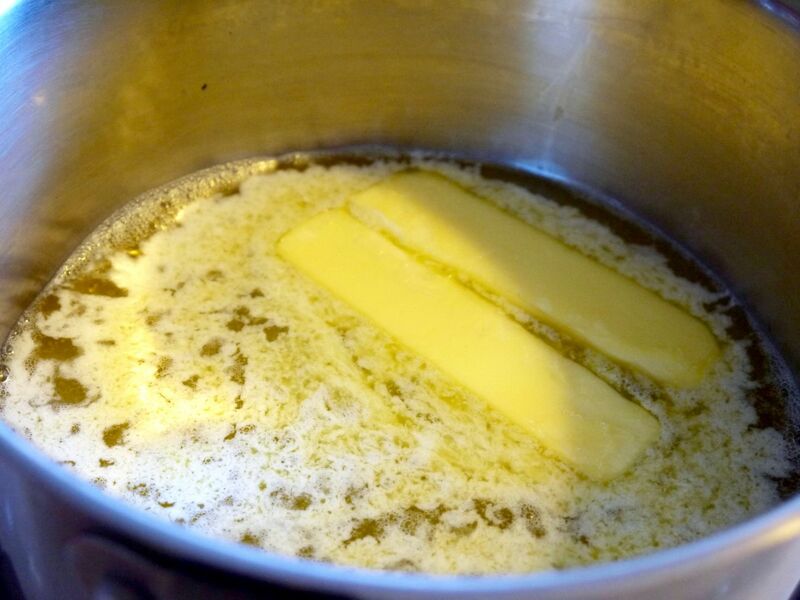 Regular butter is transformed through a sacred cooking process that evaporates the water and separates the milk solids. Known as “liquid gold” in India, this pure fat has been used for centuries for medicinal and ceremonial purposes. And it's prized in the kitchen for its high smoking point, nutty flavor and digestibility. I recently spent the afternoon in the kitchen of Vinita Jacinto, a chef and former instructor at the California Culinary Academy, to learn more about ghee. I first heard raves about ghee from my fellow yoga teacher friends. But when I saw the steep price tag of a jar at Whole Foods, my DIY instincts kicked in and I vowed to learn how to make it. When I arrived at Jacinto’s home in El Cerrito, she welcomed me with a big hug and handed me a mug of her homemade chai tea. 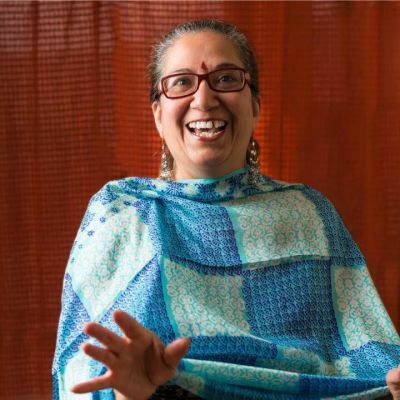 As we sipped our drinks, Jacinto recounted her childhood memories in Calcutta, India. Jacinto explained that in India, cows are sacred beings, thus dairy foods are also treated with the utmost respect. In her household, there were designated pots that were used to only boil milk and make ghee. The usual multitasking in the kitchen was paused during the ghee making process. And to further honor the sacredness of the fat, the elder women of the family would traditionally chant mantras while cooking to infuse the liquid gold with blessings. Ghee is not only used in the kitchen. Jacinto added that it served as fuel "during festivals [in India] when you want to light the lamps." 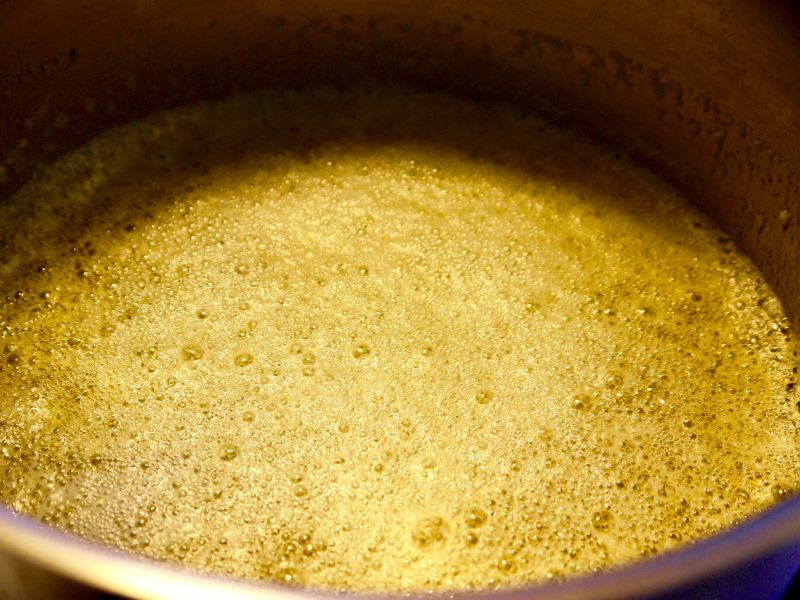 The golden fat has a very long shelf life, and she described the 30-year-old jar of ghee in her childhood home reserved solely for medicinal purposes. There's also the tradition of mothers handing down a jar to their daughters after marriage so that they'll be prepared to be a caretaker of their families. I followed Jacinto into the kitchen and she handed me a finished jar of ghee. I opened the lid and breathed in the scent of sweet caramel; no wonder it’s called liquid gold. We unwrapped two sticks of unsalted organic butter and placed them in a saucepan. "Traditionally, you begin the cooking process on low heat because you don’t want the butter to catch on the bottom on the pan," said Jacinto. As we flowed into a meditative state while cooking, I heard a popping noise coming from the saucepan that sounded like popcorn. Jacinto told me that this is the sound of the water content of the butter evaporating away. She pointed out how the white foam looked like clumpy clouds and told me to keep watching the buttery sky. After the sticks of butter were fully melted, Jacinto raised the heat to medium to speed up the evaporation process. She tilted the saucepan to get a glimpse of the bottom of the pan to make sure the butter wasn’t burning. 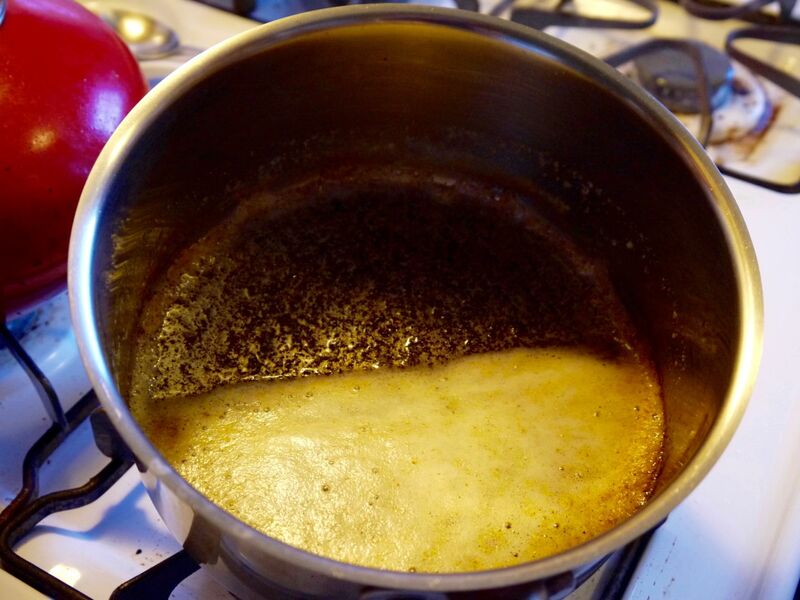 The butter cooked for 10-15 minutes, and I noticed the sound coming from the pot had changed to a gurgle. The buttery sky had also changed to a single, uniform cloud of foam -- signs that the ghee was done. Jacinto told me that each family has their own color preference for ghee. The darker it is, the nuttier the flavor. We aimed for a medium golden brown. We let the liquid gold cool for 5 minutes and poured it into a clean glass jar for its final cooling and storage. 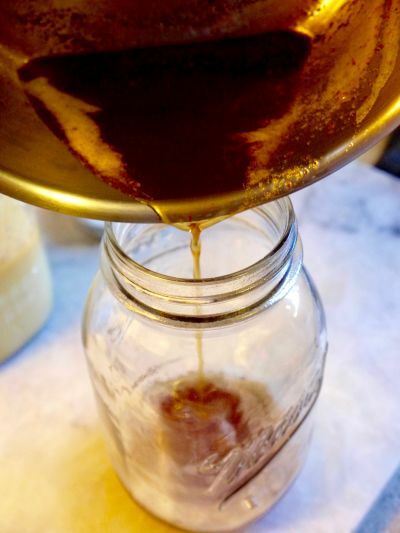 You can also pour the liquid through a fine metal strainer to filter out the milk solids if you want your ghee to be “pure.” Many cooks also use a cheesecloth to strain ghee, but Jacinto told me that she avoids it because too much ghee will be absorbed into the material. "This food is sacred, so it is important to me not to waste any of it," she said. I asked Jacinto about ghee's current popularity, evidenced by the ubiquitous presence of expensive jars sold in many health food stores. She told me that fat is making a general comeback after years of being deemed "bad." And over the last decade, yoga's popularity ushered in more curiosity about Ayurveda, where ghee holds a vital role. 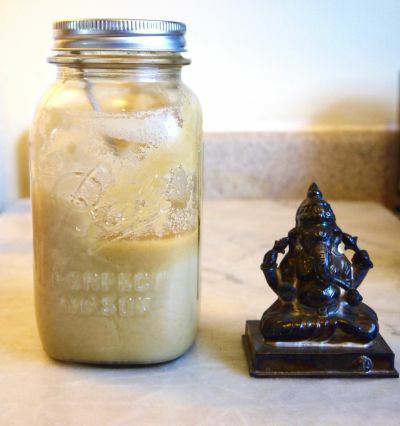 Jacinto hopes this increasing enthusiasm for yoga culture encourages people to make ghee at home so they can also enjoy the culinary and spiritual benefits of this magical fat.